Mari Mack Music: Happy Thanksgiving, Bandcamp Bundle Button and Preserving the Palace for the ARTS! Happy Thanksgiving, Bandcamp Bundle Button and Preserving the Palace for the ARTS! 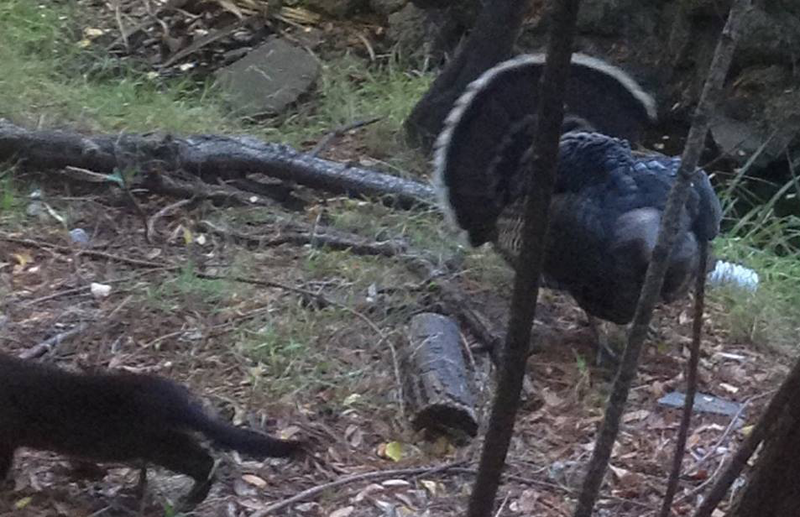 Check out this fun photo of a visiting turkey taking on the neighbors cat! 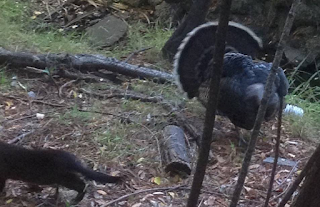 That happened in our yard, I kid you not. It's a bit blurry in spots, guess my ipad is not equipped for fast action shots. Sending love and hugs from Northern California out into the Universe to get filtered through the stars and our dreamcatchers! Please check to make sure that whatever you have in your dreamcatcher is current, because if you have a note from an old flame stuck in there while you have moved on, well, that is just not fair. Time to burn it and let the ashes take flight. Trust me on this one. You'll thank me later. December 16th at 19B in Fairfax : MM&LLK plus X's for Eyes (Tomas D.) and Fighting Smokey Joe. It's a Wednesday night and each band will be playing a set of original music. Not sure of the order yet, we may just put slips in a jar and figure it out that way. Show starts early because we know it's a school night - so check it out and quit complaining that you have nothing to do in the North Bay. December 18th at The Saloon in North Beach : 1232 Grant Avenue, SF : 3 sets of rockin' blues from 9:30 pm until 1:30 am or until I pass out - whichever comes first. LLK Lineup : Yours truly, Arne, Pat, Richard and not sure who will be keeping the beat this time around, but we plan on having a revolving drum throne for a while until we find the groove that was meant to be. Sending love and gratitude to Grampa RJ Franco, who I will always love like a brother, whether he is playing with us or not. Best wishes to you. Teaching pays a lot better than gigging and I hear you are a great teacher. On the music technology front, music artists have a cool new bandcamp feature to be thankful for : Full discography package option. If I ever get off facebook, I may end up with three albums' worth of material and be able to activate it. Seems like an appropriate metaphor for life as well as your music career - YOU have to activate it! And, last but not least - what blog post would be complete without a cause du jour ? Again, I find myself being called into a civic matter revolving around "sense of place" - only this place happens to be the deepest center of my soul : arts education. Outline parameters that only the most deep pocketed, passionate, and/or visionary would consider - since the proposal design had to include a way to pay for $20 million in "deferred maintenance." Seven proposals were presented. One Commissioner said he was disappointed that they only received seven RFCPs. Well, gee, I wonder why? Only one proposal contained a core arts component. Public comment was solicited and the process moved forward. On November 3rd, an Advisory Panel selected the top three scoring proposals as "finalists" and wouldn't you know, the ONLY arts proposal for development of the Palace of Fine Arts was not among them! Well, can you guess the reason? A low score in the "financials" department. If you look on the SF Rec and Park website, you will see there was a bit of miscommunication regarding who was and was not on a certain Advisory Board. Politics. This whole situation upset one SF resident (Kris Nangle) so much, she started a petition on Change.org -- and it took off like a mouse out of a house that had just been invaded by a bunch of laser cats. By November 19, there were 20,000 signatures on it, just in time for said author of the petition to deliver it to the Recreation and Parks department in front of an overflow crowd. I was so upset at the prospect of this place becoming a hotel or restaurant , that I felt compelled to add my two cents amidst a group of concerned citizens and potential developers foaming at the mouth at the mere prospect of putting their mark on this iconic building designed by Bernard Maybeck. 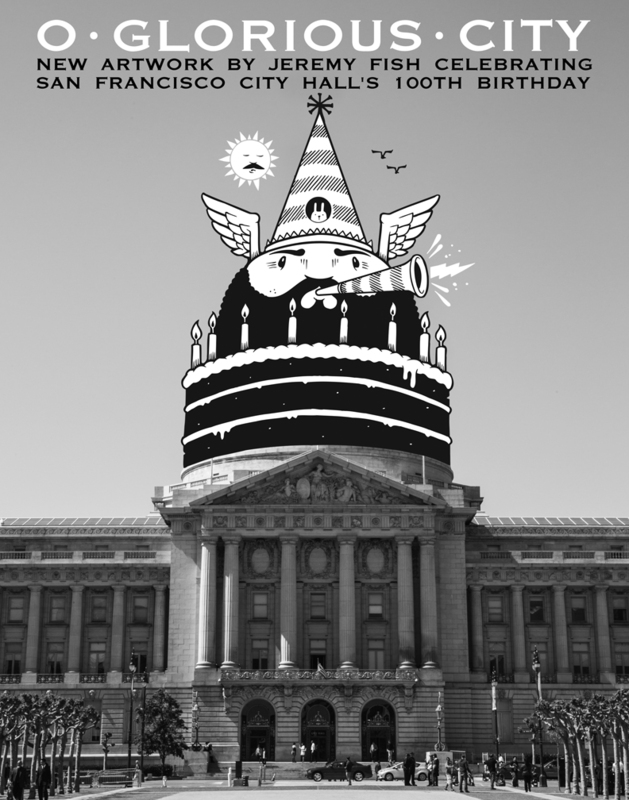 There seems to be a bad case of tunnel vision at SF City Hall. Sorry to be harsh, but I come from a place where collaboration of spirit is the norm, not an anomaly. Plus, the mere thought of any part of the POFA being turned into a HOTEL or RESTAURANT gives me a sickening feeling in the pit of my stomach and makes me want to break out the chalk again. Worse yet, SF is losing more artists to other areas at an even faster pace than the last time you heard me whining about this stuff when the music recording industry was taking a nose dive and we ended up having to leave the studio. Given the fact that Arne co founded Liquid Audio, one of the first internet music companies, pretty ironic, don't you think? As you probably have guessed by now, the very technology industry that empowers artists of all types to connect with our fans/followers/consumers is at the root of the current (ongoing?) SF Bay Area real estate gold rush. So, not only are musicians/artists unable to pay rent they USED to be able to (pay,) the rents are rising, not only in SF, but in Oakland and Richmond and Marin and Sonoma and in outlying areas. Enter more traffic jams. More and more artists are losing live/work studio spaces and jobs. Thankfully, creative people will adapt and cultivate new creative communities wherever we go. I almost feel bad for the people left in the city. Hmmm... perhaps the City has started the A-I-R program in order to guarantee at least ONE artist left in the City after the remainder are forced to move out? Either way, I love this man's work. After the meeting where we all spoke with the hope that our compelling and passionate pleas might actually make them reconsider or at the very least - delay a decicion, the Rec and Park released a statement that encouraged "collaboration." Seriously? My impression was that the City has viewed this space as a white elephant for so long that they were a bit taken aback by they deemed to be sudden interest. But then again, that seems to be the norm in these situations. Does not work for me. Check out the video if your heart can take the stress - because if you care about history, the arts or fair democratic process, it will probably piss you off. NJMHO, NONE of the proposals is the best fit. All who submitted an RFCP should be told to go back to the drawing board - and start with the title of the structure : The Palace of Fine Arts. Honestly, I'd rather see the money that spent on desecration of this Maybeck structure invested in arts programming and interactive education for kids of all ages. 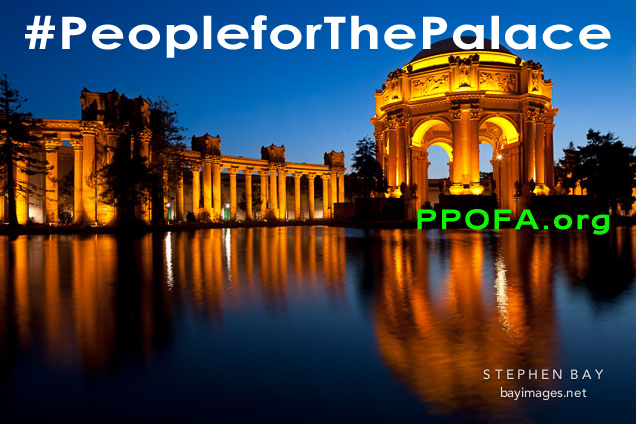 So, please take a look at this petition - if you feel that ARTS should be at the core of any plan to develop The Palace of Fine ARTS, please join me the 20,000+ people who have already signed this petition - which can be found here : ppofa.org - Maybe if we get this petition to 100,000 or so, our collective voice will be heard and heeded. Maybe not - but we have to at least try. If you are really pissed off or feeling generous, please consider making a donation to the crowdfunding campaign I started for future dance programming at the Palace. Recipients will be World Arts West (producer of the Ethnic Dance Festival and the rejected ARTS proposal sponsor) and SF International Hip Hop Dance Fest! Check it out and give us some positive feedback, preferably in the form of a donation. Please keep your negative comments to yourself. Or better yet, if you are the type of person who goes around making negative troll comments when people are trying to do something good in the world, you might want to consider getting a life. Maybe take some dance lessons? That said, if you agree that this 100 year old public treasure would be better off as a hotel or restaurant - you can do nothing. The City will probably choose the one that they feel will deliver the most tax revenue. Seems to me that something is stinking up San Francisco, and it ain't Fisherman's Wharf! As for me, I will be not only be staying tuned - I'll be taking an active role in preserving this landmark and doing whatever I can to add to the arts and innovation programs. If you have a few hours to spare and can type, the Save the Palace group on facebook could use a transcription of that 11/19 meeting video. Again, have a Happy Thanksgiving! p.s. Feel free to share this info. Love and hugs and peace and music to you all.